Smashwords this week acquired 100,000 new ISBNs from Bowker to accommodate strong growth in the Smashwords catalog. We provide these ISBNs to our authors, publishers and literary agents for FREE, as an exclusive benefit for those who utilize Smashwords ebook distribution services. ISBNs are unique digital identifiers, and they're required for authors who want to distribute to the Apple iBookstore, Sony, Kobo and others. We buy them so you don't have to. 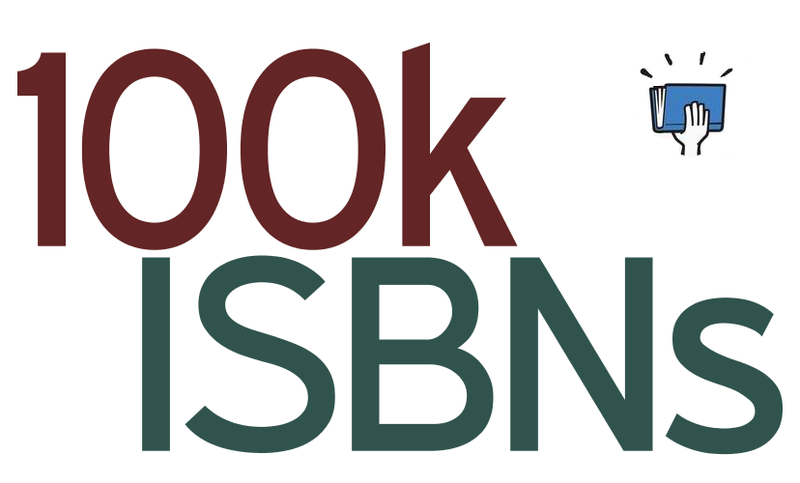 To learn more about ISBNs, visit the Smashwords ISBN FAQ where you'll find links to other ISBN resources. Smashwords authors and publishers will find additional ISBN information at their ISBN Manager page. Mark, you say at Smashwords that you are considering no longer offering the option of $10 ISBNs and that they are of no value. This is true for authors who use only a personal name when self-publishing elsewhere, but for those of us with a peronal imprint, it's bad news. ISBNs indicating the imprint do accomplish something -- they cause the imprint to appear under publisher name at the retailer's site. It may be that most buyers don't care whether there is a publisher imprint or not, but some do, even when they realize that it is an indie publication. And in the case of a book listed under an imprint at Amazon in its Kindle edition, and on its print edition if there is one. it would be very confusing not to have the same imprint shown at other retailers -- it would imply that there is some difference in the book. In the case of a group of authors who use the same imprint, it would be especially confusing not to have it appear everywhere. I issue ebooks of two authors besides myself. They're listed together on a Smashwords page, but without ISBNs showing a connection there would be no indication of it anywhere else. All I want to say is, THANK YOU! Thank you Mark Coker and thank you smashwords for the free ISBN and the three new markets I can sell my book on, that I didn't have before. I was just pricing ISBN's last week and putting KOBO on the back burner. Glad you worked out the ISBN issue. Any update on why scheduled deliveries aren't going out to partner sites? I know of quite a few people whose books are approved and set "to be shipped", but they never are. Any update on the status of premium distribution would be appreciated. Chances are you won't read this, but I'll feel better for having said it. Thank you, Sylvia, for saying what I wanted to say. And she's exactly right. For most of the authors that indie publish, they can do the free ISBN and list their books as "Published by Smashwords." It adds an air of legitimacy. But I am an indie publisher -- and I know quite a few others personally. You're cutting our throats by not offering the premium ISBNs. Our books publish under our imprint information and your free ISBNs don't offer us that option -- to publish as my imprint. You say that premium ISBNs don't offer any value and I argue that they do. I own that ISBN and I can use it on my ebooks no matter where the publish and where I can also find marketplaces to sell them. My books are registered as having been published by MY company. If this is just because people are getting junk mail, it's a poor reason to stop offering them. A better solution would be to add a nag screen telling people, "Hey, if you choose this option, here are the repercussions" and let them choose from there. Give authors their informed choices and they'll make their own informed decisions. But please, don't get rid of the premium ISBNs. There is value there and there is freedom there. Otherwise, I don't need your services. I can get my ISBNs elsewhere, publish them on the storefronts myself, and cut you out completely. I don't want to do that because Smashwords offers me a service that is invaluable. But if you take away the premium ISBNs, that may be my only option. When do you get the free ISBN? After you upload your book? I've just finished reading and implementing your Style Guide. In the book, it says you must put in an ISBN if you want to be in the Premium Catalog (I do). And I understand you give free ISBN's. I haven't uploaded my book yet, but when I click on the ISBN Manager in the Dashboard, the ISBN Manager says "Click 'Assign ISBN' below to get started". What "Assign ISBN'? My screen doesn't show anything. Linda Banche makes a good point. The Smashwords web site gives no indication of when or where one acquires the ISBN. My screen also comes up blank. there is no "click to assign isbn"
@Linda, SM, you'll attach the ISBN after you upload your book. After you upload your book, onscreen prompts will prompt you to attach the ISBN via the ISBN Manager, which is accessible from your Dashboard. There's more information on ISBNs in the FAQ. Can we use the same ISBN for all the distributors Smashwords Premium puts our books in, or do we need a different ISBN for each distributor or each format? Your comment plays in my mind as reasons not to take Smashwords offer of Free ISBNs . I was very much on the fence about it. But,as an indie author, I don't know that having another firm appear to be the publisher would benefit me, when it was me that really published the work. Bowmker would credit Smashwords as the publisher if an author choose the Free ISBNs offer. Hi Author of Lil, your concern is representative of a common misconception about ISBNs. The term "publisher" as it applies to Bowker's types of ISBNs has no legal bearing on the book's ownership, copyright or control. Nevertheless, at Smashwords we're happy to provide the free ISBN or you can purchase your own from Bowker (if you live in the US) or from another country's authorized registrar. Your choice of ISBN also won't affect how your book is listed at our retail partners, or who's listed as the publisher at the retailer (the author is usually listed as the publisher, regardless of ISBN choice). Whatever route you choose, the most important thing to remember is that the ISBN you give your ebook must be unique, never before used by you, and not the same ISBN you use for a print book.